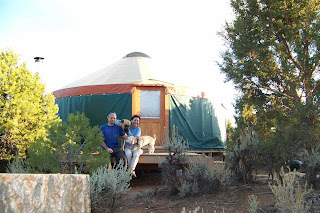 Shane and Meggie Saunders said about their recent stay, "The yurt is awesome! My wife and I had a terrific time. The setup is super comfortable, and we didn't lack for anything. We settled into a nice routine of wood-burning stove at night, and a quick warm up in the morning using the propane heater. The kitchen was perfect, the living room tailor-made for reading by the stove, and the library was perfect. My only complaint -- the bed was so damned comfortable that we got a late start on our climbing every day!"